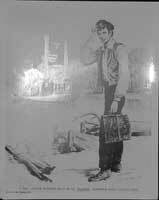 Description: Abe Lincoln, riverboat pilot on the Talisman, Sangamon River, Illinois, in 1832. Lincoln is standing at the dock as the Talisman heads for the landing. Smoke is coming out of the two stacks.